It was hard to pinpoint this nose... it begins with a toasted oak scent followed by pear and what I'm going to call a "basket of fruit" smell. 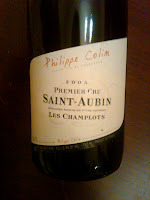 The palate is minerally with a presence of grapefruit, and has a lingering acid, somewhat silky. I would definitely call this a food wine, perhaps paired with white fish and greens. Not quite as crisp as I had hoped for, but nonetheless, it is a good wine. I have met the founder of Fiddlehead twice actually. Once at the Bottle Shop in Wilmette at a tasting, and about a year later, when my sales rep was introducing her to his accounts on the North Shore, and I had the honor of showing her around the club. We carry two of her wines, the 728 Fiddlestix from Santa Rita Hills, and her Happy Canyon Sauvignon Blanc from Santa Ynez Valley. Kathy is incredibly sweet and very passionate about her winemaking. The Seven Twenty Eight has a wonderfully spiced nose with hints of whole cloves, earth, and a deep black cherry. The palate has a black pepper quality with again earth and stone fruit flavors. It is silky on the mid-palate and has a dry finish with a small lasting flavor of fruit. I have really become fond of Fiddlehead since starting at the club. It has been well-received by our members, and having the chance to meet the owner and show her where her wines are appreciated really makes for a special memory of the wine. Cheers to Kathy! 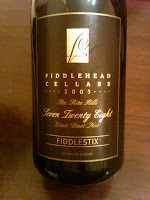 Please check out her website at http://fiddleheadcellars.com/.